If you are in search for friendly, spirited, and smart middle-sized dogs, the Golden Dox might just be the best match for you. The Golden Dox or Golden Weiner is a hybrid coming from two popular parents – the Golden Retriever and the Dachshund. Having come from two parent breeds that are vastly different from each other, the Golden Retriever Dachshund mix makes for an interesting pup. In this article, I will be talking more about these adorable puppies and what to consider before taking them home. What is a Golden Dox? Also called a Golden Dachshund or Golden Weenie, the Golden Dox is a designer breed that has an impressive lineage. The Dachshund is Germany’s favorite dog for centuries and the Golden Retriever has been on American Kennel Clubs’ list of most popular breeds for five years in a row. Both the Golden Retriever and the Dachshund have been household pet favorites for years. With its parentage, it seems like the Golden Dachshund is made for dog superstardom. It’s no wonder where the Golden Retriever Dachshund mix inherited its spirited nature. Golden Weiner dogs are true people lovers; they love cuddles and just being around their human family. They are good around children, making them ideal house pets. Their friendly nature, however, does not make them ideal guard dogs. Golden Weiners are more likely to welcome strangers than scare them off. They are fine with other dogs, but not with other pets such as rabbits or cats. The Dachshund in them has the tendency to look at smaller animals as prey. Golden Dachshunds are not nuisance barkers and would only bark when they sense that something feels wrong. Golden Weiner dogs are a smart and highly energetic bunch that loves to play outdoors, something that they inherited from their parent breeds. You have to be ready to trade your couch for outdoor playtime. Golden Retriever Dachshund mix need at least 60 minutes of play a day to release all their pent-up energy, or they may turn to chewing and digging. Golden Dachshunds are quick to pick up on commands and learn tricks, but, just like any other breed, it is best to train them young. Starting training as early as 8 weeks old curbs their Dachshund tendency to be stubborn. The eager-to-please Golden Retriever side craves human affirmation so he will seek opportunities to make you happy. But this does not mean that the Golden Dox will obey all the time. Training for the Golden Retriever Dachshund mix has to be both positive and firm. They love positive reinforcement such as praise and treats for a job well done. Just like any mixed breed, it’s not easy to predict how a Golden Dox would look, as Golden Retrievers and Dachshunds are different in size, coat, and body structure. How Golden Weiner puppies turn out will be largely dependent on which parent breed their genetic makeup is leaning towards. Some of these puppies have the head of a Golden Retriever and the body of a Dachshund, while others take on a different appearance. These hybrids are also described as little Golden Retrievers or bigger Dachshunds. How big do Golden Retriever Dachshund mixes get? The average size of a full-grown Golden Dox is 10 to 23 inches (25 to 58 cm) in height and around 30 to 60 pounds (13 to 27 kg). There are also breeders who can give you miniature Golden Dox puppies, which are bred from Golden Retrievers and Mini Dachshunds. However, not much information is given on how tiny Mini Golden Dox puppies can get. 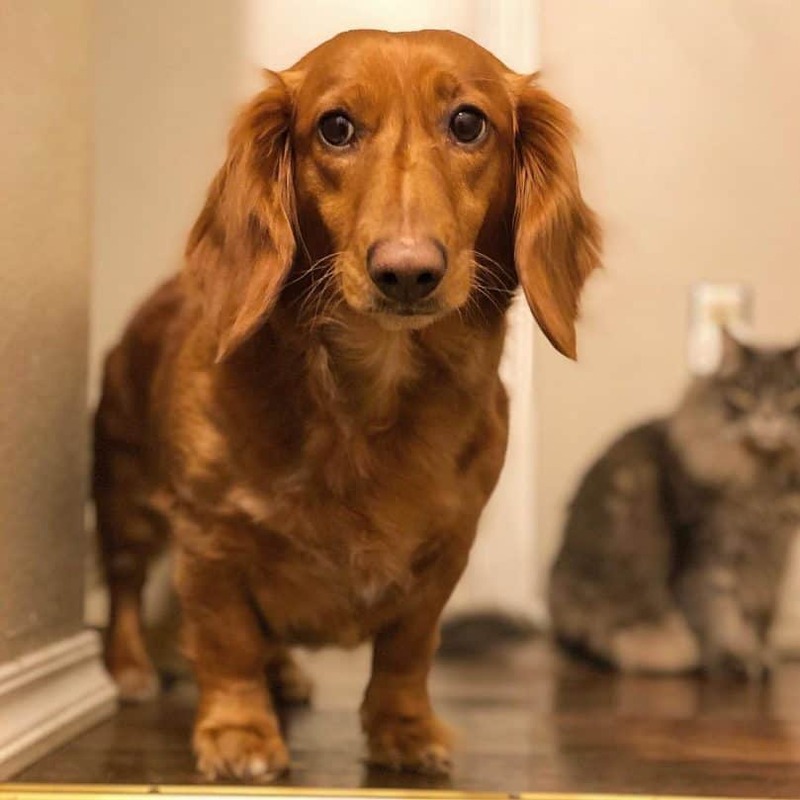 The Golden Weiner inherited its muscular build from its Golden Retriever parent and got the long body and short legs of its Dachshund side of the family. His ears are floppy as both of his parent breeds’. This hybrid’s not hypoallergenic. You can expect moderate shedding from the Golden Dox all throughout the year. Their double coat can vary from short, medium, or long depending on what they inherit from their parent breeds. The hair can also be smooth or wavy. Grooming the Golden Weiner dog is simple. Daily brushing should keep their coat shiny and tangle- free. Visits to a groomer every other month is also recommended to ensure their coats remain healthy and attractive. Golden Dox ears need to be checked and cleaned once a week to avoid ear infection and his nails should be clipped every two to three weeks. Teeth should be brushed daily or at least three times a week. How can I keep my Golden Dox healthy and happy? 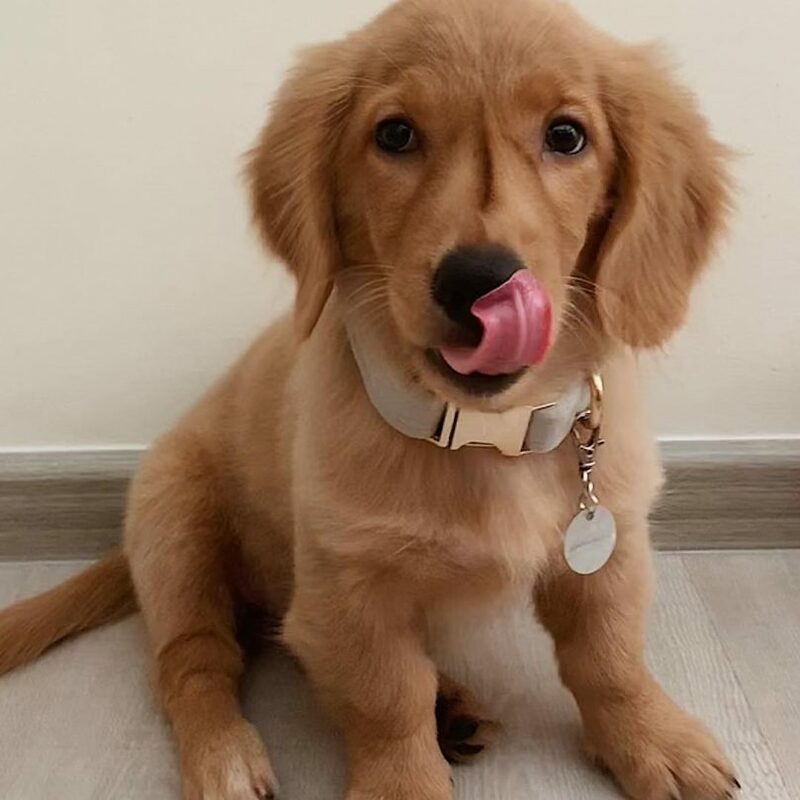 Aside from regular exercise, good-quality dry dog food designed for the Golden Retriever-Dachshund mix’s height, weight and age should keep him happy and healthy. Dog food that’s best for Golden Retrievers will also be ideal for Golden Dachshunds. Some owners also opt to keep their Golden Retriever Dachshund mix on a BARF diet for healthier skin, shinier coats, higher energy levels, cleaner teeth, and smaller stools. The average lifespan of a Golden Dox is 10 to 14 years. Some common health issues are the same as what its parents have. These may be ear infections, intervertebral disc disease, and hip dysplasia. Where can I buy a Golden Dachshund? Golden dox puppies cost about $500 to $1000. You can get them from breeders, but, sometimes, you can find a Golden Dox for adoption at rescues and shelters. 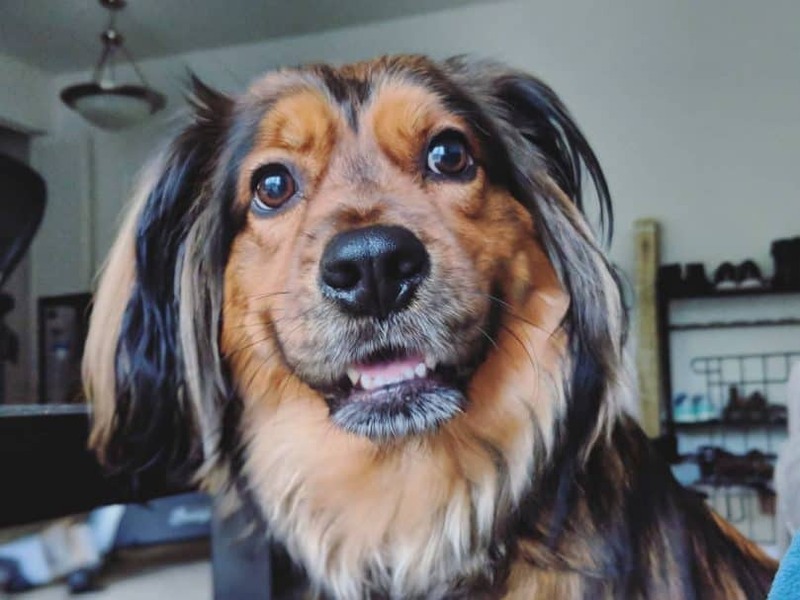 Breeders who focus on the Golden Retriever-Dachshund mix may not be common, but you may check breeders of the Golden Retriever and the Dachshund. Overall, the Golden Dox is ideal for an owner who can take the time to go out and play with it. They are active dogs that want you to be with him in their daily activities for them to be healthy and happy. These crossbreeds can be high-maintenance when it comes to your time and in affirmation. If you have the stamina, the Golden Retriever Dachshund mix is perfect for you. If you want to share your experience with the breed, feel free to submit a comment below.